The traditional royal collection of lions in Morocco is an important part of the Barbary lion story. The sultans of Morocco kept animals in palace gardens for centuries and lion cubs were offered by tribes from the Atlas mountains as tributes to the ruler. In the 1500s and 1600s prisoners were reputedly thrown in with the beasts; artwork produced at the time alludes to this practice. By the 1800s the collection had become more benign and the lions in the palace at Fez were eventually transferred to a purpose built Rabat Zoo in the late 1960s. The label “Moroccan Royal Lion” was revived in the paper by Yamaguchi and Haddane (December, 2002) which revisited the history of the animals of the royal collection in Morocco and links to certain lions in zoos today. The television series ‘Museum Secrets’ series included some background on the Barbary lion in an early episode on London’s Natural History Museum, the home of lion skulls discovered in the Tower of London in the 1930s. The following clip includes a short historical overview of the potential link between the Moroccan Royal lions found in zoos and the Barbary lion. This entry was posted in History on June 12, 2014 by Simon Black. The Barbary lion lived in the Mediterranean Maghreb, the northern, mountainous area separated from the rest of Africa by the Sahara, with the Atlantic coastline to the West and the Mediterranean sea to the north. Historically the species was seen in the lowlands to the coast right up to the High Atlas (at 4000m). This varied ecosystem included snow in the winter months in the Atlas mountains, dry forests in the lower valleys and arid plains south of the Atlas edging the desert. The following figure shows the distribution of lions as sighted between the years 1500 and 1900 (see Black et al 2013). 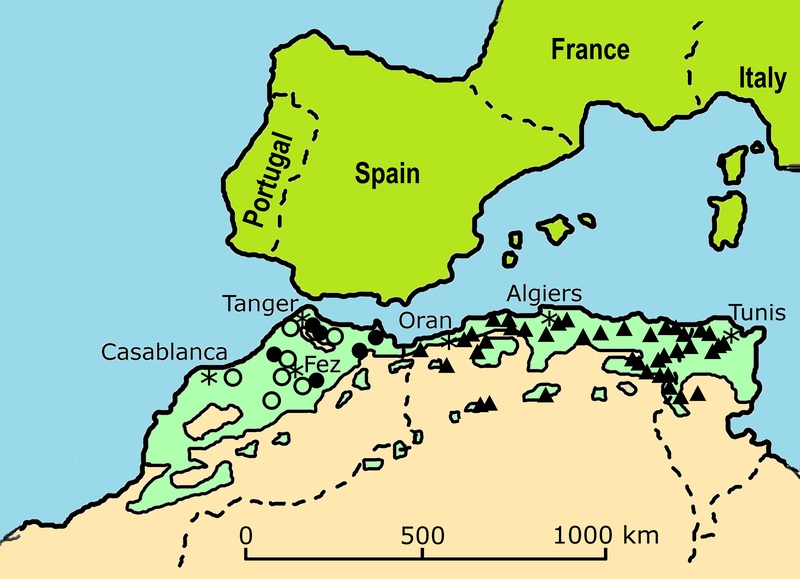 Light green shading indicates Mediterranean scrubland ecosystems running from Morocco in the west along North Africa, north of the Atlas, Saharan Atlas and Tell Atlas mountain ranges into Tunisia. Few if any lions survived east of this region (in Libya) after 1700. Earliest accounts in the western Maghreb from 16th to the 18th century are indicated as open circles, whilst documented sightings from 1800 to 1900 are indicated as black circular markers in the western Maghreb and as triangular markers for sightings in eastern Maghreb. Asterisks (*) denote locations of human population centers. Dashed lines indicate national boundaries. This entry was posted in Ecology, History on June 5, 2014 by Simon Black. The Barbary lion story of decline and survival in remote micro populations rarely encountered by humans is relevant to the current demise of lions in West Africa. Lions have been reduced to perhaps just 250 individuals across the entire region. Just 10 years ago estimates for the population in this region ranged from between 850 and 1163 lions, suggesting something like a 75% decline over the decade since. A brief article outlines some of the recent research findings. It is likely that radical approaches will be required to sustain lion populations in future. For example the establishment of fenced reserves is currently being seen as one part of the solution. Brian Clark Howard has summarised the situation well in National Geographic Daily News – click on their map link below. This entry was posted in Conservation on June 5, 2014 by Simon Black. Several research studies over the last few years have started to identify where the lions of North Africa sit in the family tree of lion populations across the globe. The 2006 paper by Barnett, Yamaguchi, Barnes and Cooper explored how mitochondrial DNA sequences could be used to differentiate lion populations, using ancient samples of known origin. This work included identification of a sequence apparently unique to Barbary lions. These techniques were used to confirm that the lion skulls retrieved from the moat of the Tower of London in the 1930s were in fact Barbary lions (these skulls are now held by the Natural History Museum). In the same year Burger and Hemmer published mitochondrial DNA analysis of a cub derived from the collection of the King of Morocco, now held at Rabat zoo. A recent follow-on study by Barnett et al (2014) has continued to show similarities between Barbary lions and Asiatic lions, differentiating them form sub-Saharan African lions. Matt Walker at the BBC Nature website has written a good summary of the latest research. This entry was posted in Genetics on June 5, 2014 by Simon Black. Popular consensus is that the last lions disappeared from Morocco nearly one hundred years ago, clinging on in the remote Atlas mountains up to the 1920s, but exterminated from the rest of North Africa much earlier and certainly by the 1890s. However recent research has challenged this view. The research has prompted a number of interesting summaries for example John Platt’s blog article in Scientific American. Yamaguchi N, Haddane B. 2002. The North African Barbary lion and the Atlas Lion Project. International Zoo News 49: 465-481. Schnitzler, A.E. (2011) Past and Present Distribution of the North African-Asian lion subgroup: a review. mammal Review, 41, 3. This entry was posted in Extinction, History on June 5, 2014 by Simon Black. The link below takes you to the 2010 article which identified the total population of animals derived from the collection of the King of Morocco, which was moved from the lion garden at the palace in Rabat to a then newly constructed Rabat zoo in 1969. Since that time several animals and their progeny have moved to zoos around the globe. Their descendents are now only found in zoos in Europe and Israel, plus the remaining animals in Morocco, recently moved to a modern park, le Jardin Zoologuique de Rabat. A number of other zoos across the globe claim to have animals descended from this lineage, or considered descendents of the Barbary lion, but have this provenance is yet to be confirmed. This entry was posted in Zoo Research on June 5, 2014 by Simon Black. The Barbary Lion blog shows news & research on Panthera leo leo, the legendary ‘Barbary’ lion or ‘Atlas’ lion of North Africa. We already have about 50 short articles on this site. The Barbary lion is now extinct in the wild, but the story of its natural history provides lessons for lion conservation today. We want to engage you in the research currently being undertaken by leading centres of excellence in genetics, extinction modelling, ecology and natural history. Several research groups, all involving international collaborations of research scientists, have conducted work over recent years which has better informed our understanding of big cat conservation, in particular lions. A number of zoos, including Rabat Zoo in Morocco, Port Lympne Wild Animal Park in the United Kingdom and a host of other zoos in Europe have been actively involved in lion research work, with an interest in lions of possible North African origin. This is matched by interest in a range of zoos and private collections elsewhere in the world, particularly in the United States. If you are interested in this research effort we will aim to provide links to their publications through this site. 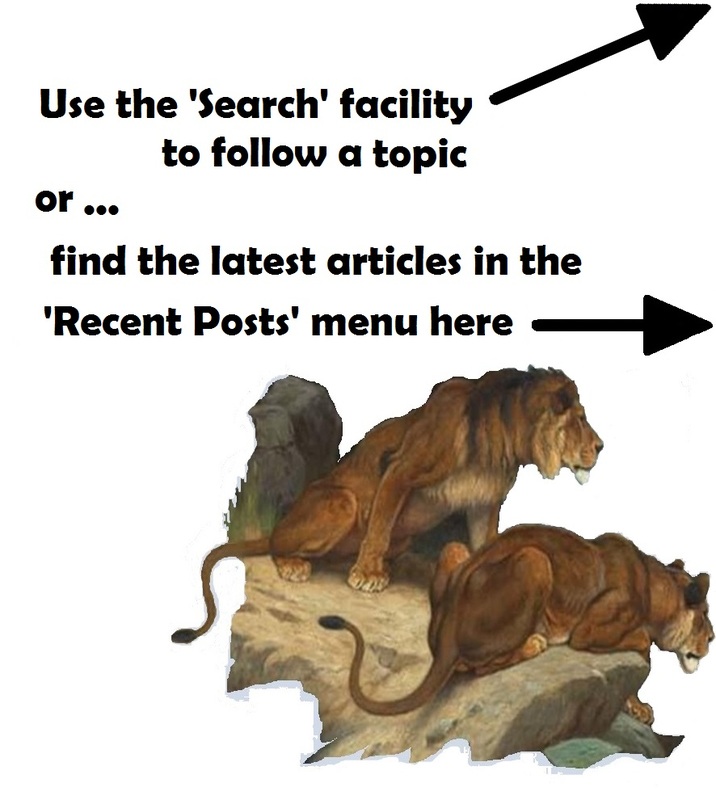 To access the blog articles, click on the menu themes at the bottom of each page, which cover Conservation, Ecology, Extinction, Genetics, History and Zoo Research. We look forward to your comments and contributions and hope that there are ways in which you can help us to learn more about the Barbary lion story and its relevance to big cat conservation. Simon’s research includes the genetics, history and ecology of lions in North Africa. He also has other interests big cats, reptiles & birds, in collaborations with researchers across the globe. 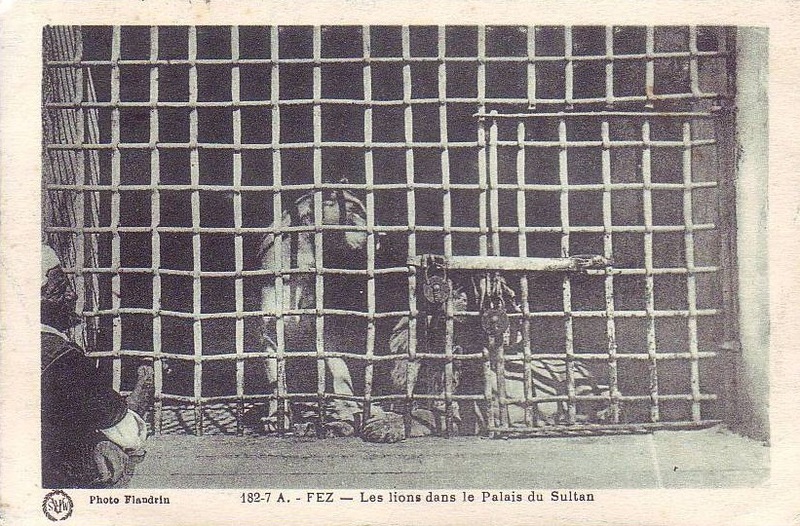 Simon developed the zoo studbook for lions originating from the King of Morocco’s collection. The studbook is used by the European Association of Zoos & Aquaria (EAZA) and currently supports the monitoring and transfer of lions for conservation breeding. 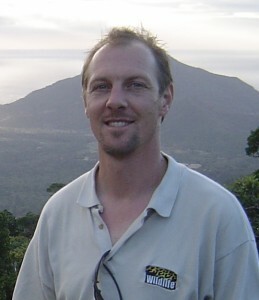 Simon also works on leopard & tiger conservation and human-wildlife conflict in the Middle East and South Asia. Simon has trained hundreds of conservation professionals over recent years in effective conservation project management and leadership. This entry was posted in About Us on June 5, 2014 by Simon Black. Welcome to the Barbary Lion blog. This site has been developed to bring the latest news and research on the natural history of the Barbary lion (Panthera leo leo). This site outlines recent research on the lions of North Africa, now extinct from the wild. The story of these lions still provides lessons for big cat conservation today. We want to engage you in the research currently being undertaken by leading centres of excellence in genetics, extinction modelling, ecology and natural history. We are looking forward to hosting several guest contributions each year from various experts in the field of ecology, genetics and conservation. This entry was posted in About Us and tagged barbary, lion on June 4, 2014 by Simon Black.